This past weekend, I had the good fortune to experience the musical My Fair Lady at the Heritage Theatre Festival in Charlottesville, Virginia, where my son Daniel Berryman played the role of Freddie. He was pretty spectacular, I thought (hey, I’m his father), but that’s not the point. The point is that My Fair Lady is a bang up show, and a puzzle. And all of a sudden, I find myself wishing I had the chance to direct it. Not that there was anything wrong with the production I saw; on the contrary—it was really, really good. Allen Fitzpatrick (another fine Seattle actor) was stellar as Henry Higgins, Charles Sutherland’s Colonel Pickering was great, Kenneth H. Waller as Alfred P. Dolittle was a delight, and Emelie Faith Thompson gave us a lovely Eliza and sang beautifully. A smaller role of note: Lydia Horan’s portrayal of Mrs. Pierce was superb, challenging Higgins with real power. And of course, the guy playing Freddie captured me completely. But by the end of the second viewing on the same day, it was the play that really caught my attention. 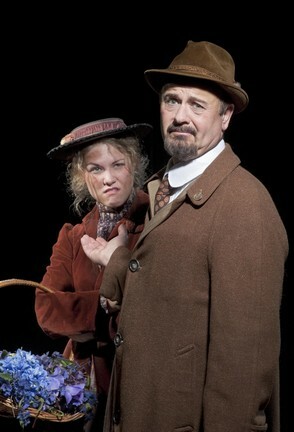 My Fair Lady is based on George Bernard Shaw’s Pygmalion, in which a British gentleman who specializes in speech gives a cockney, flower-selling “guttersnipe” of a girl a shot at middle and/or lower-upper class life by way of correcting her speech and manners. He does it by means that are militant, near abusive, and profoundly effective. At the end of the play, the girl is truly transformed. But then she’s discarded, and in a well-deserved fury, Eliza leaves the Professor, at which point he has a bit of remorse at losing her. His awakening is ambiguous at best. Since this is a musical, we all sort of think that Eliza loves Henry, but frustratingly, we never actually see much evidence of it. The two of them get one bit of celebration—including a dance—after she finally gets the “Rain in Spain” speech right, but after that…pffft. And then, inexplicably, in an ending that infuriates and confounds almost everyone, Eliza returns to Higgins in order to…? What? Is she going to be his lover? His assistant? His housemaid? Who knows? Here’s the problem. The book for this musical is, in my humble opinion, pretty spectacular. This is George Bernard Shaw (nearly–the adaptation by Alan Jay Lerner apparently lifts a lot of the text straight from the play), for goodness sake. I haven’t yet compared the texts of Pygmalion and My Fair Lady, but Higgins is deliciously verbose, witty, and caustic as he skewers the ideals and manners of the Empire. And the confusion of poor Eliza as she achieves her “elevation” is (if you really think about it) heart wrenching. I can’t help but believe (like I said, I haven’t really researched, so correct me if I’m really wrong) that Shaw was using the romance primarily as a vehicle on which to hang his sharp and insightful social criticism. We tend to ignore the fact that this musical seems strange to our sensibilities. Let me float a hypothesis: while the lower and upper classes are certainly differentiated, that difference is neutralized by the ever-present stylistic smile. What we know in our hearts is that if, at the end of a performance at the Seattle Opera, the well-heeled patrons were to come pouring out only to be greeted, hounded and confronted by beggars and the cardboard carrying homeless aggressively looking to score a handout or the sale of a fake Rolex (please pardon the stereotypes—I’m referencing the action at the top of the play), the tension and fear would drive a whole new appreciation of the stakes of what Higgins proposes when he brags he can change the “guttersnipe” into a princess. To a postmodern culture, while economic advancement (in an egalitarian kind of way) drives much social activism, to suggest that one need adapt language and manners in order to “rise” in the world is patently offensive. Who is to say Eliza needs changing? On the surface of things, we no longer believe that a person’s worth and standing should be based on the kinds of trivial nonsense Higgins spouts about the English language. And surely we don’t have a class system as England does and did. In 2011 in America, the incomes of the upper classes and middle/lower classes are spreading further and further apart. Intellect and educational opportunity are still battlegrounds (without judgment, I observe that reading the magazines of Newsmax.com and Mother Jones are very different intellectual experiences). The dual realities of Eliza’s rage at being treated as nothing more than “baggage” and her notable desire to raise herself out of hand-to-mouth poverty are palpable even today. And how about the whole notion of language and how it relates to the majority class and what it means to be an American? But these street-level realities have real bite to them, just as Shaw’s work does. But in My Fair Lady, the bite goes away until Eliza comes back to Higgins at the very end, and we are confounded. But think about this: the relationship of Higgins and Eliza is economic if it is anything. What happens if they each become class symbols and Shaw’s idea is for us to see that relationship is often economic? Surely that’s not so today? I’m probably just being the guy people accuse me of being, the guy that over-thinks things (it’s just a musical, Jeff…c’mon!) but I can’t help but wonder what you might get if you gave the My Fair Lady world a bit more bite? In the sequel, Eliza becomes a strong, resounding voice for Women’s Rights (“Votes for Women!”), using her charm and wit (and elocutionary skills) to woo audiences to her cause. Now it becomes her turn to teach Professor Higgins how an extraordinary intellect hidden behind a mask of poverty can make a powerful difference in a troubled world. I adore gritty reboots. If you direct it, I’d love to audition. Jeff, I’d love to have a discussion with you about socio-linguistic theory. I’ve done a tiny bit of study in that area this year.